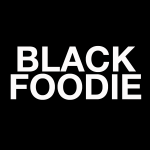 It’s one of the most interesting and heated food debates amongst the diaspora. I’d even say it’s the most epic food beefs of all time. I’m talking Drake vs Meek Mill- Epic. Twitter rants have ensued, diss tracks have been dropped and all in the quest to answer one question. Which African nation makes the best jollof? If you have any doubt of the seriousness of this question. I’m going to need you to pull out your phone and call a Nigerian friend- or better yet log on instagram right now and check the memes. It’s hilarious. Jollof- the beloved rice dish cooked in a delicious sauce takes on various forms, flavours and shades across many countries in West Africa. From Senegal to Ghana to Nigeria to Sierra Leone and several other countries- jollof rice has been and still remains a highly contested food. And a battle this legendary deserves attention. 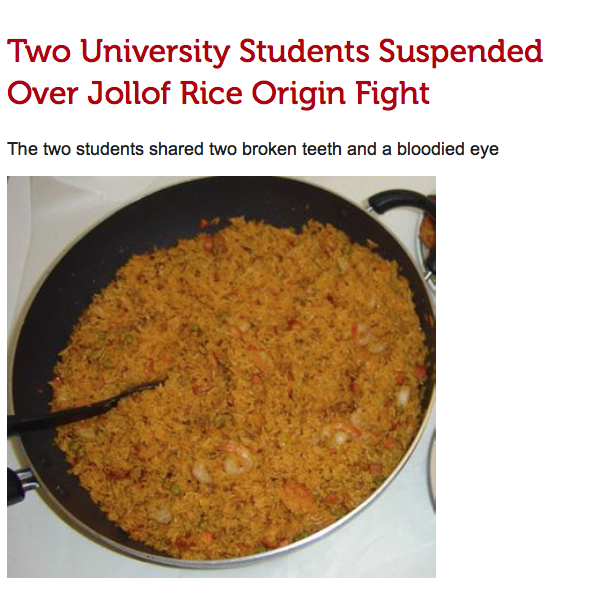 Here are some of the highlights in the recent history of the jollof wars. If you still have any doubt’s about the special place jollof rice holds in the hearts…and stomachs of west Africa. I shall refresh your memory. Do you remember a couple years back, when Jamie Oliver insulted the palettes of Africans everywhere when he put up a recipe for his “version” of jollof rice? The twitter upheaval that followed was insane! I mean this guy really f’d up that recipe. Grab some popcorn…scratch that, some chinchin and scroll through the comments. The collective response taught us, don’t ever mess with a west African and their jollof rice. But alas, mainstream outlets are infamous for taking our foods and acting as experts on things they know nothing about. Now if you think that was serious let me point your attention to a story that was circulating last year that said someone had being hospitalized in a jollof debate. 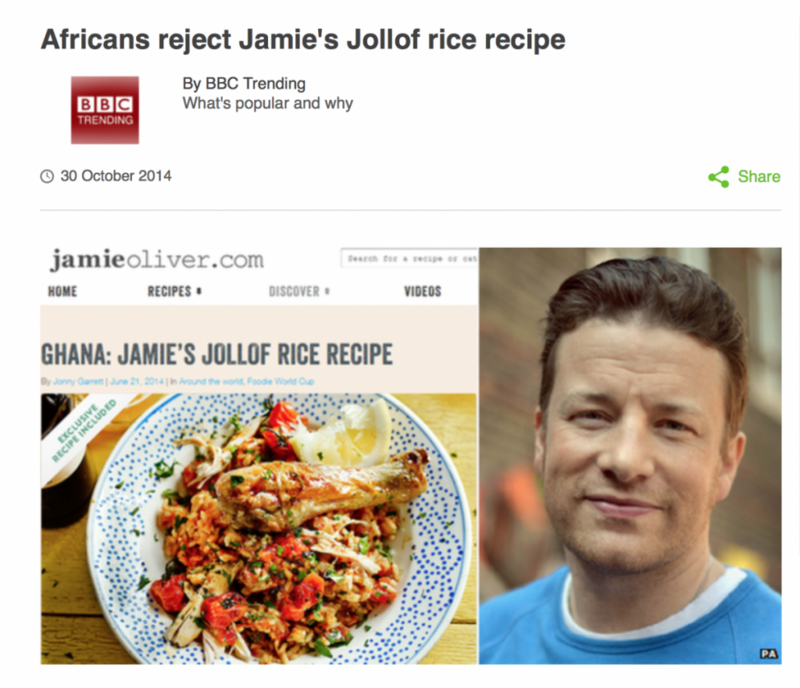 Now I’m pretty sure this foolishness was as fake as Jamie Oliver’s recipe for jollof. But know that the laughs that came from it were very REAL! Over the past few months, the lack of viral content almost had me believing that the jollof wars had simmered down, but recently word on the street is that the Jollof wars have re-emerged. Senegalese Chef Pierre Thiam recently was asked to set the record straight according to True Africa, he explained Senegal is the birthplace of jollof and that they of course own the title of best jollof. Even Kerri Hilson chipped in but with a much more safe answer. But probably the best addition to the current jollof war right now has been Sister Deborah’s track, Ghana Jollof. She was dropping bars with lines like “I have d secret recipe no Maggi cube, when your Naija boy chases me don’t blame juju.” A clear jab at the way Nigerians cook their Jollof rice- she went in! As an East African, my first introduction to jollof rice was years ago at a potluck. It was the Nigerian type and man was that rice spicy! I thought I could handle the heat- but I wasn’t ready! But since then I’ve sampled a number of different varieties from Nigeria and Ghana- and I loved it. But there are many more versions to try. I wanted to know how to settle this food beef. That’s why I approached Chinedu, the Creative Director behind Supafrik, a contemporary African-inspired art | fashion | music | food travelling pop-up shop and gallery to do an event that showcased the best in jollof. I wasn’t surprised to hear that he too had been exploring this theme. He actually has a dope shirt coming out soon for all you jollof rice lovers. So we have now joined forces to bring the Jollof Wars to a rest with the most epic food battle Toronto has ever seen! This stands to be the most delicious showdown in history. Are you ready to join Supafrik and Black Foodie as we host the ultimate food tasting/ Party ever- and help us settle this once and for all? We searched the city to find the Top Chefs and caterers. 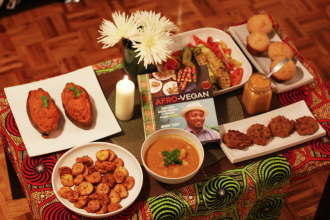 Stay tuned as we introduce you to to the top African cooking talent in the city.